← Samson Didn’t Sweat the Small Stuff! That’s how it is on the foreign mission fields. Missionaries will go in and begin doing soul winning. Then, as these new converts begin being taught, God will raise up men who can become pastors and begin their own churches in their own national country. Those nationals can then bring others to the Lord and disciple them, and, when those disciples are ready, they too can go start their own works. Eventually, the national churches can begin sending their own missionaries out to other parts of the world…and on the cycle can go. That’s basically how it goes for the family unit. The Smiths have four children. Each child gets saved and grows in knowledge and love for God through the years. The Smith’s four children have children, and their children (the Smith’s grandchildren) now grow up in church and have their own families. This will cause an exponential growth in the Church, and the surrounding communities of each individual church will be the better for it because the church itself is built upon a strong foundation of solid families who will continuously add to the church with each passing generation. However great and noble that concept is (being a type of missionary to your children) there is much work to be done with the rest of your family. Parents, aunts, uncles, cousins, in-laws, siblings, and others, are all part of the extended mission field that is yours. In my particular family, if I took a quick head count, I’d have to come up with about twenty-six names, on my side alone. That number could probably be doubled once I add in the family members on my wife’s side. To my knowledge, at this point in time, none of the people counted are Christians. But all have the potential to be reached and all have the potential to begin the cycle of adding solid families to the Church for generations to come, but only if they are reached. Which is why in previous years, with our Christmas card list, we sent Christmas cards filled with the Gospel message and the plan of salvation. I think in concept we can all agree that reaching out to your family is the right thing to do. But we’ll all agree that it’s not the easiest thing in the world to do either. We have to face the dreaded three “R’s” of witnessing. There’s the risk of Rejection. There’s the risk of Resentment. There’s a risk of being Ridiculed. None are fun and often deter us from grabbing a small open door of opportunity. That’s why I decided this year to stop praying for opportunities to share my faith with people, because the opportunities have always been there, if I’m honest with myself. What I decided to focus my praying on this year is for God to give me heaping helpings of courage and boldness. Because I can have countless open doors, but if I won’t walk through them…what’s the point. Noah was a missionary of sorts to the people of his day as Second Peter 2:5 states: “And spared not the old world, but saved Noah the eighth person, a PREACHER OF RIGHTEOUSNESS, bringing in the flood upon the world of the ungodly.” So what made Noah an effective witness for God and the people around him? Let’s look at his characteristics for a bit. Noah was a righteous man (Genesis 6:9). He was favored by God in his day and found grace in God’s eye (Genesis 6:8). Noah, no doubt, found favor and grace in God’s eye because he was obedient. We can surmise this because God gave Noah the task of building the ark and I’m sure it’s because Noah was obedient to God in the past. 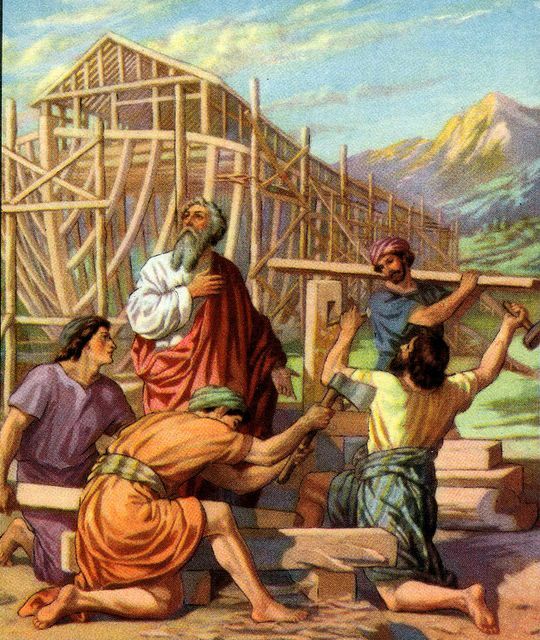 In Genesis 6:22 we read, “Thus did Noah; according to all that God commanded him, so did he.” What God commanded him to do was to build the ark according to all the specifications God gave him. But this ark was not only going to save his family, but it was also going to be very symbolic of the type of Savior Christ was going to be. So, Noah, stepping out in faith and doing what he believed God wanted him to do, embarked on this journey to build the ark for a day when God would send down rain. Remember, Noah did not yet know what rain was because it had not yet rained on the earth at this point, but because God told him to do something…and he obeyed…his family was saved. Now, about that ark. The people during Noah’s time, I’m sure, saw Noah toiling away at the ark daily. But the people at this time didn’t see the same need for being a passenger on that ark that Noah did. After all, no one else knew what rain was and saw no coming danger. They were a wicked generation (Genesis 6:5) with continuously evil thoughts living in a society that was marred with violence (Genesis 6:11) and corrupt in many of its ways (Genesis 6:12). That is much like our generation today. But Noah preached righteousness (Second Peter 2:5). I can imagine Noah working on the ark, building it in the middle of one of his fields. As he hammered and cut and sweated day after day, he would take a break from his work and preach repentance and warn others of the coming dangers. Now, the Bible says that Noah walked with God (Genesis 6:9). To put it another way, you can say that Noah lived a holy life of separation. He probably had a sterling testimony and was above reproach in his dealings with his neighbors, but that did not stop his neighbors from ridiculing, resenting, and rejecting Noah and his message. See, Noah knew the end was near for those being left behind once God started the rains and shut the ark door. Noah knew the danger (Genesis 6:13). So Noah preached righteousness and most likely built the ark in plain sight of everyone. We live in a time when we are in THE Ark, saved through the blood of Christ. We live in a generation exactly like Noah’s day. Yet, if God called us to build an ark today, we’d probably go deep into the woods and build it where few people would ever know it was being built. In other words, because I lack the courage and boldness to preach righteousness, my Ark is hidden from view. I have no doubt that people saw Noah’s big boat and approached him asking him what it was all about. That provided an open door that the Scriptures tell us Noah took advantage of. Not only that, but Noah led a sanctified life that would catch the eyes of others. But again, we may fall short of displaying a sanctified life. For instance, I haven’t drunk alcohol in for many years, yet my brother keeps offering me my favorite beer every holiday. Because I lack the courage and boldness that Noah portrayed, I just decline his offer with a flat, “No thanks.” What I should do instead is say “no” with an explanation of why I don’t drink anymore. I may not be articulating this well, so let me try to tie this all together. Would God have used me, in my current state, to build an ark back in Noah’s day? No! Noah was righteous, and I’m saved…we’re even there. Noah was obedient…in all things…hmmm…point for Noah. Noah preached righteousness while living a sanctified life that gave credibility to his witness. I witness…sometimes…depending…uhmmm another point for Noah. Noah’s ark was plain to see. I already lost that point to Noah because I mentioned earlier I would have built mine in secret where only people really close to me would discover it and maybe ask and question and then MAYBE get the WHOLE truth. Example: If my brother offered Noah a drink, I bet Noah would have explained to him why he doesn’t drink with more spiritual detail. I often get convicted when I think about a couple of things that I (and maybe many of you also) do. I own several hockey jerseys from my favorite college and pro teams. I proudly wear them and have no difficulty “getting into it” with fans of other teams. Like that’s going to matter an eternity from now. But how do we handle it when someone denies God exists or does not believe in Heaven or Hell or anything like that? Do we debate with the same fervor as we do when our favorite sports team is degraded by a rival fan? If you’re like me, the answer, sadly, is NO! We say little to nothing and justify it by saying we don’t have enough head knowledge to intellectually challenge this person. Yet I’m sure we can probably make a better case for why we believe the Bible than we can for believing why our sports teams should win the championship that year. The second thing is this…ever find yourself at work and sitting down to eat? Do you close your eyes and make it evident to those around you that you are thanking God for your meal? Or do you sit silently for a few moments with your eyes opened, praying to yourself as you stir your coffee? I’ve already confessed that I’m praying for courage and boldness to be a better witness and testimony, but I praise God I’ve gotten better at that. Again, how are we ever going to reach people, whether it’s our families or our neighbors, and not show ourselves to be different? The bottom line is this, and I really believe this is the case, that those of us who struggle with witnessing and being testimonies fear the three “R’s.” But think on this…if you’re one of those people who fear the ridicule, rejection, and resentment, it’s because it is uncomfortable to deal with and maybe even hurts our feelings a little bit. So because the experience may be unpleasant, we want to be Christians with the least risk to ourselves. Oh, it comes at the cost of someone else, but at least we kept ourselves safe from possible ridicule, resentment, and rejection. What it comes down to is that we care about our physical and emotional well being more than the other person. The bottom line is that we love ourselves more than the other person. We’re going to look out for ourselves first, and witness and share our testimonies at times when the risks are minimal. That’s what I mean about building our ark deep in the woods. We’re not in the fray like Noah was. We’re not showing Christ out in the open. Oh no…He’s hidden from view most of the time. So yeah, I’ll come out and tell you, the reader, that I have a long way to go, but I can be equally honest in saying that I recognize my shortcomings. Not only that, but I can recognize that these shortcomings are unacceptable. And I have no problem sharing this with you because I highly doubt I’m alone in this. What would be sad is if you are in the same situation as me, but feel no conviction to change. So you can wonder where you’d have built your ark had God asked you, but if I’m honest, I’m pretty sure God wouldn’t have even asked me to build one in the first place. This entry was posted in Blessings, Character, children, Family, Godliness, Heaven, Love, marriage, Ministry, Prayer, Rejection, Relationships, Reputation, Resentment, sin, Testimony and tagged Bible, Character, children, Christian, Christianity, Death, Dying, faith, Family, God’s Word, Heaven, Hell, Marriage and Family, Ministry, missions, noah, noah's ark, religion, Reputation, stewardship of our children, Stewardship of our Spouse, Syewardship of Our Testimony, Testimony, theology. Bookmark the permalink.